Last week’s blog identified areas of your property you should inspect after a severe storm. Some of those areas include roof, siding, outdoor structures, and fallen trees. A common claim scenario that insureds deal with after a storm is fallen trees. High winds and saturated ground can create the perfect storm. Earlier this summer, heavy storms rolled through my sister-in-law’s neighborhood. After the storm cleared, she inspected her property. What she found was a large branch from her tree extending into her neighbor’s yard. Initially, she assumed it would be her responsibility to file a claim with her insurance company to cover the damages and removal. She quickly learned that this is a complicated situation, which can cause intense arguments between once friendly neighbors. A standard homeowners policy (basic form) typically protects you from the causes of loss (perils) listed below. Below are some common questions and answers regarding how a standard homeowners policy may respond. 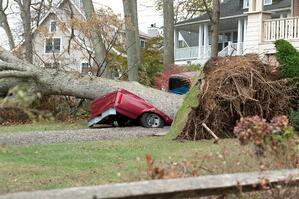 Q: If my tree falls and damages my home or property, is it covered? A: Typically, a standard homeowners policy covers damage caused by a fallen tree if the cause of loss (peril) is wind. Covered property includes your home and other structures, such as a fence or shed. If a tree falls on your car and turns it into a Matchbox car, your auto policy will provide coverage if you have purchased comprehensive insurance. Q: If my neighbor’s tree falls on my home or property is it covered? A: This is a situation where your relationship with your neighbor can sour. If your neighbor’s tree falls on your property due to wind, you’re responsible for the cleanup and contacting your insurance company to see if there’s coverage for any damage sustained. If there’s coverage for the damage, you’re responsible for paying your deductible. The same would be true for your neighbors if your tree falls on their property. This is where the conflict started with my sister-in-law and her neighbor. Her neighbors felt it was absurd that they had to pay for debris removal charges for a tree that wasn’t theirs. In some situations, neighbors will agree to split the debris removal charges as an act of good faith. Because this turned into an ugly situation, my sister-in-law paid for the tree removal. Q: My neighbor caused the tree to fall, am I still responsible for damage? A: If you can prove that your neighbor’s tree fell because it was diseased or dead and they didn’t do anything to prevent this, then they’d be responsible for your property damage due to negligence. In addition, if your neighbor cut down a tree and it fell and damaged your property, they would be responsible for that as well. Q: Do I have coverage for debris removal? A: Depending on your policy, you may have coverage. The basic homeowners policy could pay up to $500 for the removal of any one tree and up to $1,000 for any one loss. Unless stated differently in the policy, your homeowners deductible would apply for this type of loss. Some policies might specify that the tree must have damaged a covered structure or is blocking a driveway in order for debris removal coverage to apply. Some policies could provide coverage for tree debris removal regardless of whether or not there's other damage to property. Q: Do I have coverage for damaged trees or shrubs? A: Another portion of your policy could reveal coverage that would pay for damaged trees, shrubs, and other plants. It would list those perils for which coverage might apply. So many variables can come into play when determining coverage. Review your policy with your agent; he or she will be able to answer any questions you have about your coverages, or they can check with the carrier on your behalf.